After some fun with learning HTML/CSS/JS, I’ve written a basic textboard site with Flask. It’s open source and it’ll grow as I work on it. It’s quite minimal at the moment, which is nice actually. Try it! Whew! So the update is out after a few hours of slaving over Photoshop (on my Linux Mint install might I add) and fidgeting with Android’s packaging process. I’m pleased to see that Play Store approved my update pretty much instantly. Anyway, here are the new promotional assets in their full glory. Download the app! And I did not forget about freedom, check out the source on GitHub. I’m pleased to report that not even a week after posting my first devblog I have enough coming out to release another — I think I’ll be tying them to Play Store updates. I found that working with the sparsely documented KivyMD framework for Material Design compliant widgets was a breeze in how they worked as I’d expect them to. The update comes at the same time as I use a new phone, adding to a repertoire of phones I have lying around to do tests. On two of them it seems to be smooth sailing. This is also demanding some new promo art on the play store page to match the material design motif, which will come with the update. The appropriate research information for pregnancy is in place and translating that into code is the next step. I have not had luck in contacting the appropriate UCR professors for diabetics. Still have a big todolist prior to working on that. Localization stuff has code in place but until everything else is checked off it won’t be translated into functionality. So in keeping with free software this update will go out on to the github repository with appropriate installation instructions at the same time as I submit the Play update. Cheers. Using KivyMD for a material design compliant UI. Already working on that. Handling diabetics. I am currently in an email conversation with professors from the University of CR on the subject. I feel there is no better standard to implement and present at a national level than the educational and nutritional standards of our constitutional education facility. Pregnant women. This is the same situation as above. This is a thought in my head that I’m probably going to research after posting this: It’s known to people with a grasp on nutrition that a calorie is not a static amount of energy. Whether or not we can provide a proportion to how much one calorie is really worth with an extra input might work. Localization. The code is embedded in my local files and honestly it’s just kinda sleeping until I provide the rest of the features. Everything listed above requires text and, to constantly add onto the localization for every thing I do instead of making sure everything is accounted for at once sounds like less of a mess for my brain to process. I do expect to be publishing this iteration of the app into a new (again) github repository. Stay tuned for that. I’d like to note that I hope to submit devlogs, vlogs and photos to the ULACIT for their student leadership grant to study software engineering. CalTrac is moving to the Kivy platform! On top of a slick modern interface I am targeting android devices for release. Have a look at the commits as I get to work on reinventing the system and adding new features. Implementing a day tracker system (saving a profile of the day) for averaging intake over months and weeks. Some sort of graph or statistic sheet using Kivy’s graph garden plugins. Material (or flat) UI design. Kivy Launcher seems to like the project for now, but man do I have to learn mobile design measurements. Be sure to watch the repo. CalTrac is a graphical desktop application with a goal to visualize and raise awareness on the importance of calorie intake in our daily diet. Current nutritional standards generalize us into the 2000 calorie diet and our purpose in this project is so both find where we might find ourselves in the personal calorie needs, and to create an application that puts this value in context with what we eat by portion count. 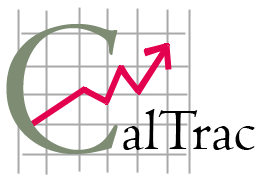 Nutrition is a numeric matter and CalTrac’s codebase is a combination of Python 2.7 and SQLite3 implementations. Native look and feel is provided by Python’s minimalist Tkinter library. The application achieves a desired personal estimate on caloric intake needs by the well-studied Harris-Benedict equation and provides recommendations on losing and gaining weight over time by means of hard limits on how little we should eat, and works in standard increments of 500 calories per day. 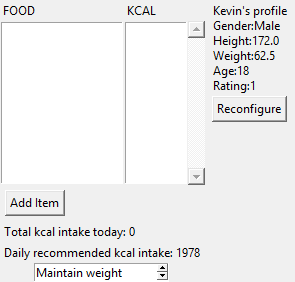 This is complemented by a personal tracker of items eaten, summarizing them in calorie intake by portion which is compared as a total with the recommended intake number.